On my trip to Raleigh, I had experienced a profoundly unique moment two days in the making. On Friday, while sitting on the plane, I was catching up with podcasts. The first one I chose to listen to was a recent NPR Planet Money follow-up profile to the Panera Cares media that had been buzzing earlier in the decade. Panera Bread opened up a chain of non-profit, pay-what-you-want cafes across the country starting in 2010 under their Panera Cares umbrella. While the podcast alluded to one more remaining location being open in Boston in January 2019, reports had since surfaced that it would be closing its last location in Boston in mid-February 2019. Many media sources have been looking at how values-driven decision-making can be problematic to maintaining financial sustainability. Because I have had so many students who have been interested in the idea of pay-what-you-want cafes to help foster dialogue and feed those in need, I started compiling resources on this case. …but something interesting happened the next day. Saturday morning, I woke up, and before presenting at the Sullivan Summit, I had to find a quick and simple breakfast within walking distance to the hotel and conference venue at Campbell University School of Law. One place was close and open, and so, in the spirit of needing caffeine, I walked 0.2 miles to the nearest cafe. Where I ended up was at A Place at the Table, Raleigh’s only pay-what-you-want cafe, which I did not know until reaching the counter. This cafe is one of only about 60 cafes in the U.S. within the One World Everybody Eats network. It felt very “full circle” moment for me, to say the least. A very pleasant surprise, indeed. Sometimes, life seems to present themes to you that all seem to come in at the same time, crafting a message that seems like divine intervention and meant to be. In fact, it was hard not to spook the staff member informing me about the cafe’s mission due to my excitement. I looked around, and I was grateful to see the cafe flooding with people at 8 am on a Saturday morning. After ordering, I had to keep shifting myself out of the way to deal with the incoming traffic of customers. I tried to eavesdrop on a conversation of a staff member speaking with a woman who came by to ask about local shelter resources. The cafe seemed to embody the beauty of everything the model hopes to be, with all welcome and all cared for, in the same space. It was a glimmer of hope for a troubled model that the recent Panera Cares closure story had once again put in plain sight. If I did not have to present in less than an hour, I would have spent much more time being a “fly on the wall” to people watch. I soaked up the experience as much as I could while waiting for my order, paid double, and hurried along with my to-go bag back to the conference venue. The cafe has only been operating for about 15 months, but I hope it will thrive, helping to show that, perhaps, this concept is not as financially unsustainable as we might think. 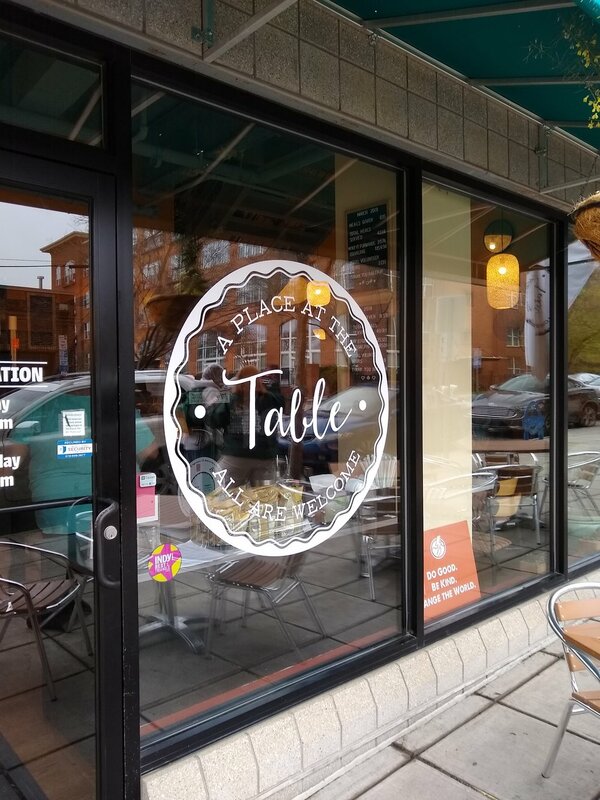 If traveling to Raleigh any time soon, please give A Place at the Table your business (and a donation), or visit one of the cafes nearest to you!